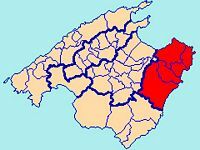 County of Levant or comarca of Levantine (Comarca de Llevant / Comarca de Levante) is a region northeast of the island of Majorca, whose capital city is Manacor. 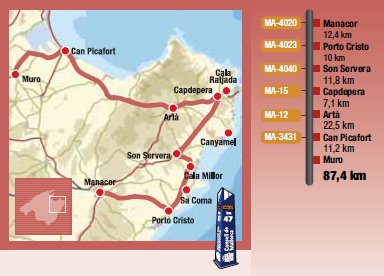 Other important cities are: Artà, Capdepera, Sant Llorenç des Cardassar and Son Servera. The region is characterized by its mountainous terrain, which includes the northern and central parts of the Serra de Llevant. The county of Llevant includes two mountain ranges that form part of the Serra de Llevant: the massive Artà and Serra de Calicant. The massive Artà, North County, is the highest part of the mountain of the east and forms the peninsula of Llevant, between Punta de n’Amer, the Punta de Capdepera and Cap Farrutx. The main summit is Sa Talaia Freda (561 m), but there are also other important summits such as Puig Farrutx (522 m), the Puig d’en Xoroi (489 m), the Puig des Porrassar (481 m) The Puig its Tudossa (444 m) and Puig de sa Talaia Morella (432 m). The Serra de Calicant, northwest of Sant Llorenç, has the main peaks of Puig Calicant (473 m), the Telègraf (418 m) and Puig d’en Sard (413 m). County Levant is bordered to the west by the county of the Plain of Majorca (Comarca de Pla de Mallorca) and to the south by the County of Mid-day (Comarca de Migjorn), where the southern end of the mountains of the Serra de Llevant. The capital of the county of Llevant, Manacor, is not only the city of pearls (you can visit the factory Perlas Majorica) and furniture: it also has "Es Palau", the Church of Our Lady of Sorrows, the towers "Ses Puntes" and "dels Enagistes"; important archaeological remains of the area surrounding part of the historical heritage of Mallorca. On the east coast, former fishing villages, for the most part, been swallowed up in mega-resorts, there are, however, some nice resorts that have avoided the worst excesses of concrete and glass, such as the old port of Porto Cristo and Cala Ratjada. In Porto Cristo, you can visit the Caves of the Dragon (Coves del Drac) and Caves of the Harpoons (Coves dels Hams). To the north, we meet many beaches and coves up before reaching Sa Coma (with fortification Punta de n’Amer) and the bay of Cala Millor where the towns of Sant Llorenç des Cardassar and Son Servera are found. Heading towards Capdepera we will fork on the road to the caves of Artà and to the beach of Canyamel (with its medieval tower). Capdepera has a castle, a fishing harbor, Cala Ratjada, lively holiday box of beautiful beaches, a beautiful coastline covered with pine trees and a panoramic view from the lighthouse of Capdepera. At Artà, there is "Ses Païsses", a prehistoric site, the Sanctuary of Sant Salvador in the citadel, the old town and two other shrines in the area. The tour continues to the north of the county of Pla de Mallorca, in the direction of Can Picafort and Muro and on the way we will make a detour to visit the seaside resort of Colónia de Sant Pere, on the north coast of Llevant. Leaving the caves of Porto Cristo to the south and along the coast, a couple of beaches, known under the general name of beaches in Majorca (Calles de Mallorca) is encountered, the best known are Cala Antena, Cala Romaguera and Cala murada.